Shiplies Bubble Mailers are the ideal recourse for sending every holiday and festival gifts through the mail safely and effortlessly!. Each mailer is made of thick, durable paper and is lined with air filled packaging plastic bubbles inside. Perfect for shipping a large variety of applications such as shipment of CDs, DVDs, books, jewelry ,handbags,gifts and pharmaceuticals. 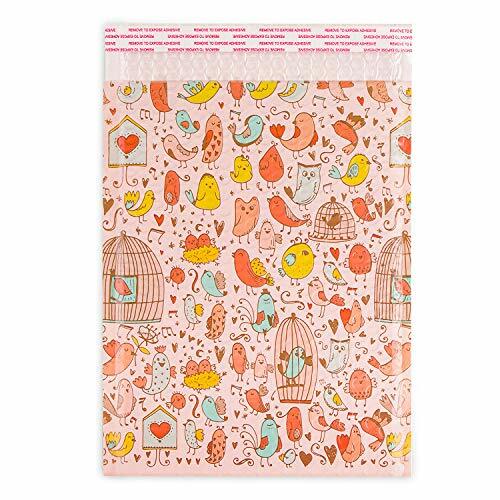 Your customers or loved ones will remember you when you ship in these Awesome Pastel Pink Pattern Bubble Mailers! Set yourself out from the crowd, and let your products or gifts get noticed before they even open it!! -Pink outer surface/white inner lining and printed lovely bird pattern design across both the front and back of each bag is perfect for packaging and sending gifts during the holiday season. - Pressure sensitive adhesive provides a high strength durable closure, water and dirt resistant. - Non transparency for privacy protection. - Lightweight saves on postage. -Meets US Postal regulations for standard packages. Usable inside dimensions: 8-1/2" x 12"
If you have any questions about this product by Shiplies, contact us by completing and submitting the form below. If you are looking for a specif part number, please include it with your message.